doTerra With the iWonder SIsters This Week For Some Great Rewards and Freebies! Yes!! Recently we shared an article about why we doTerra. Besides the amazing and unrivaled quality and purity of the essential oils, the company itself places integrity, fair wages, and equality, high on its list. So when you purchase a doTerra product, you are not paying a middle man, you are helping to serve and thank the country and the local workers and farmers of that country, who work hard to source these amazing essential oils for our use. This week doTerra is offering one of its amazing specials that we can offer to you! 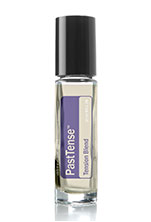 Free Past Tense Blend Tension Blend PastTense®, dōTERRA®’s proprietary blend for tension and the discomforts associated with headaches, provides calming comfort with the strength of CPTG® essential oils of wintergreen, lavender, peppermint, frankincense, cilantro, marjoram, roman chamomile, basil, and rosemary. Packaged for convenient application in a roll-on bottle. For aromatic and topical use. 2. For a purchase of $100.00, you will receive 25 points towards your next purchase! 3. For any doTerra essential oil over $400, like the super duper essential Natural Solutions Kit, you get all the above rewards, plus a free Deep Blue Roll-On for aches and pains! If you have any questions, please contact us! Andie and I thank you for giving us the opportunity to share this great product with you! Previous Post TWO RANCH WOMEN!! !